Some colleagues have me on their standard publication list, which allows me to quickly announce their new papers. Some papers get to my attention with some delay, e.g. through the Zoological Record. A paper by Thompson (2012) on a new Autocoptis species from Haiti falls into the latter category. Urocoptids are very diverse, but most species have received little attention after their original description, their data mostly repeated by later authors without discussion. From newly collected material in Haiti, Autocoptis paulsoni n. sp. is described (including the anatomy), and the relations with A. gruneri (Dunker, 1844) is discussed; other taxa within the genus are listed. Thompson, F.G., 2012. 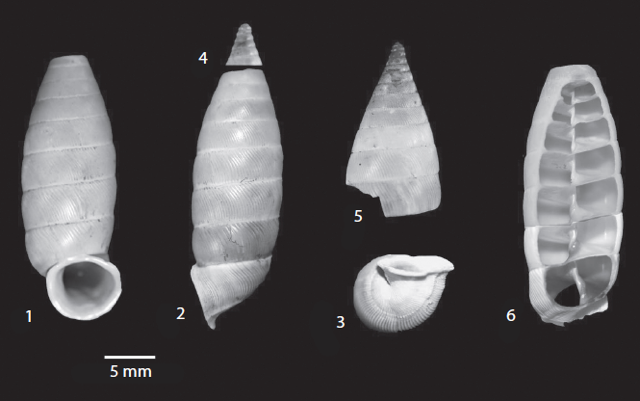 A new species of Urocopitid land snail from Haiti and a discussion of the genus Autocoptis (Gastropoda: Urocoptidae). – Revista de Biologia Tropical 60 (3): 1187-1193. This entry was posted in Uncategorized and tagged literature, taxonomy, urocoptidae, westindies on August 9, 2013 by bramb.